Mats Engman looks at the military and political consequences of suspending the joint U.S.-ROK military exercises announced at the recent U.S.-DPRK Summit in Singapore. 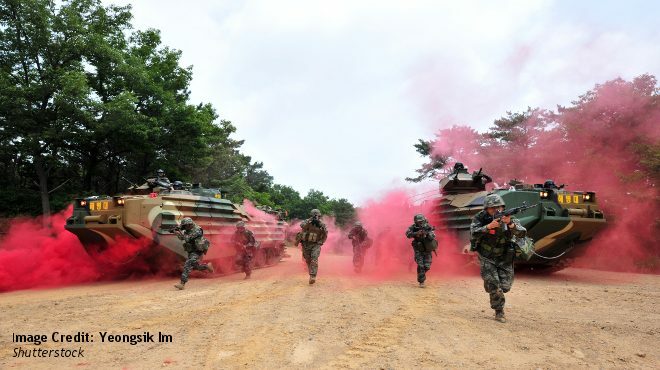 Annual joint military exercises between the U.S. and South Korea are an integral component of the two countries’ defense alliance, based on the U.S.-ROK Mutual Defense Treaty signed in 1953. Accordingly, President Trump’s announcement at the June 12 Summit that military exercises would be suspended took many by surprise, including both President Moon and the U.S. Department of Defense. It seems clear that the decision had not been negotiated and agreed upon by the two alliance partners in advance of the summit. By branding them as “provocative” and “expensive,” Trump argued that their suspension is necessary to proceed in negotiations in “good faith” with North Korea. Indeed, their suspension may contribute to further reducing tensions on the Korean Peninsula. However, the one-sided decision by the U.S. President will inevitably have military and political consequences for the credibility of American alliance obligations. The agreement with North Korea to suspend “war games” gives very little guidance on the timeframe, scope, and what type of exercises are envisaged. Comments after the summit, however, indicate that these are unlikely to encompass all military exercises, but most likely the two large-scale, joint military exercises Key Resolve/Foal Eagle and Ulchi Freedom Guardian. Foal Eagle is a combined field-training exercise that generally lasts up to two months in March-April each year. Currently one of the largest military exercises in the world, it involves several hundred thousand soldiers and civilian personnel. It is also a very complex exercise encompassing different types of smaller exercises in the air, at sea, and on land. Key Resolve is a computer-simulated command post exercise which employs modern simulation technology to train staff at various levels using various scenarios and simulated events. Typically taking place in August each year, Ulchi Freedom Guardian is also a computer-assisted command post exercise and is arguably the largest computer-assisted simulation exercise in the world. All services – the army, navy, air force, and the marine corps – are engaged in the exercise as well as civilian elements. Another type of exercise likely to be suspended is what is generally referred to as Strategic Deterrent Options – SDOs. These “options” are design to train and demonstrate U.S. extended deterrence, that is, the nuclear capability of the U.S. Such exercises normally include overflights of B-52 and B1-B bomber aircraft and the deployment and/or exercises of nuclear-capable naval ships and submarines close to the Korean Peninsula. From a military perspective, the suspension of SDO exercises is arguably less significant for the alliance as a whole. Indeed, similar exercises can be conducted in other geographical areas. However, for field training exercises like Foal Eagle, any suspension will have a direct effect. This is exacerbated by the fact that most senior military officers are rotated on a two-year cycle. Furthermore, suspension potentially imperils the early return, as advocated by President Moon, of full operational wartime control of combined forces to South Korea (often referred to as OPCON transfer). Such a return entails meeting certain criteria that require training and validation – one of which is the capability to plan and conduct large-scale military exercises. While in the short run the cancellation of one or two exercises will not likely seriously affect the alliance, in the longer run their suspension will undoubtedly affect the capability, development, readiness and operational effectiveness of the alliance, and, in so doing, raise question marks over its credibility and deterrent effect. To mitigate some of these consequences, there may be a shift in focus towards an increase in unit training, participation in international military exercises, and conducting less “sensitive” computer-assisted exercises. U.S. Alliance Commitments in Question? Perhaps the most delicate issue in what is likely to prove a long and complex process of denuclearization and peacebuilding on the Korean Peninsula, is not to jeopardize, or even create questions around, the U.S. alliance commitment, especially before North Korea’s denuclearization is verified. While President Moon has publicly endorsed the suspension of military exercises, President Trump has also talked of unilaterally reducing the number of U.S. troops in South Korea and even mooted “bringing them home” in the future, as well as pressuring Seoul to contribute more in terms of payments for U.S. troop deployments. This is likely to generate further tensions within the alliance and be anxiously watched by other alliance partners, notably Japan. Furthermore, combined with other measures by the Trump administration, such as imposing tariffs and quotas that undermine existing trade-related agreements, Washington’s actions are leading its allies to question its long-term commitment to its decades-long alliances. While still premature, this could nonetheless trigger serious discussions in South Korea and Japan on a “post-alliance future” that would necessitate increased defence spending and could even potentially lead to an arms race in the region. In sum, to both address what North Korea sees as the provocative nature of joint military exercises, as well as to simultaneously maintain the credibility of the alliance, a combination of down-scaling the exercises and introducing confidence and security-building measures may have been a more prudent option. Major General (ret.) Mats Engman is former Head of the Swedish delegation to the Neutral Nations Supervisory Commission (NNSC). He has joined ISDP as a Distinguished Military Fellow. The views expressed are his own and do not necessarily reflect the position of ISDP or its sponsors.